Method :- Mix all the above ingredients together and make a dough (neither Soft nor Tight) by adding warm water. Divide the dough into equal portions and roll in round shape. 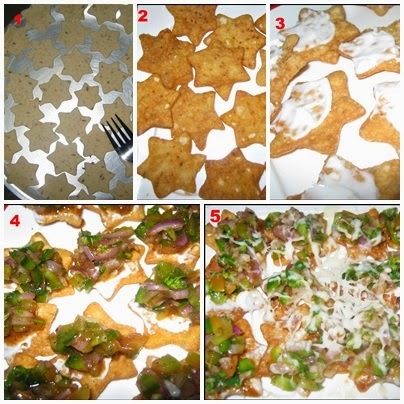 Cut it by cookie cutter in round shape-triangle shape or star shape (which I've made) and prick all over with a fork. Deep fry in low-medium flame, soak in absorbent paper and keep in an air-tight container. Any one can also bake it in microwave. Roasted Capsicum - 1 no. Raw Tomatoes - 3 nos. Roasted Tomatoes - 2 nos. Method :- Cut the veggies (roasted capsicum, roasted tomato, raw tomato, onion, garlic, coriander leaves, green chilly) in small pieces or blend just a whirl (Don't make a paste) in a veggie chopper. Mix all the ingredients together in a bowl, don't add water to it. Add lemon juice, dry herbs, salt and sugar and mix it well. Method :- Heat oil in a pan. add the crushed garlic and saute. Add grated cheese and stir continuously, when it starts to melt, add milk, maida and cook 4-5 minutes. Add crushed pepper and mix it. Remove it from falme and keep aside. Put evenly the Tortilla chips on a serving plate. Spread a layer of salsa on it. Pour cheese sauce and now its ready to it. Serve remaining Cheese sauce and Salsa separately in a bowl. 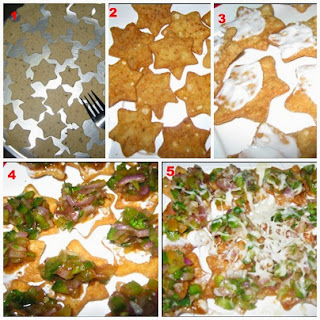 NOTE :- Any one can use extra fresh cheese by grating over the nachos and microwave it for 10-20 secs until cheese melts. Ummmm...its really yummy..:) Try it and Enjoy with Ur family, frenzs and specially Kids must luv it..